Audiences headed to the Duke of York’s Theatre in 2019 will be treated to this wonderful comedy from writer Laura Wade that has already taken theatregoers by storm at the Theatr Clwyd in North Wales at the National Theatre on London’s South Bank. Home, I’m Darling stars The IT Crowd’s Katherine Parkinson as past-obsessed Judy and she, alongside equally talented co-stars, will take audiences on a hilarious journey through the trial and tribulations of marriage. It has already received positive reviews in its non-West End homes and there is no reason it can’t become of the New Year’s must-sees! Judy is a 21st century woman whose ideals are routed in the past, so when she is made redundant from her job she sets her sights on her marriage. Pretty soon she is attempting to be the perfect 1950s housewife, with all of the pitfalls that that brings, as marriage brings out other problems in her life. We will see what does (and doesn’t) go well in the marriage and see how things that seem sickly sweet on the outside might be hiding something different altogether. Many will recognise Parkinson in the role of Judy as she not only played the part at the Theatr Clwyd and National Theatre, but has also appeared in numerous well known television programmes over the years. Her credits include the mentioned The IT Crowd, plus Humans and Doc Martin, alongside theatre roles in the likes of Dead Funny at the Vaudeville Theatre and Before The Party at the Almeida Theatre. Meanwhile, writer Laura Wade has also made a name for herself during her career. She has written shows like Tipping The Velvet (based on Sarah Water’s novel) at the Lyric Hammersmith, Posh at the Royal Court Theatre and Alice at the Crucible, Sheffield, amongst a host of others. She is an acclaimed writer whose work has many fans and regularly sells high amounts of theatre tickets across the country. 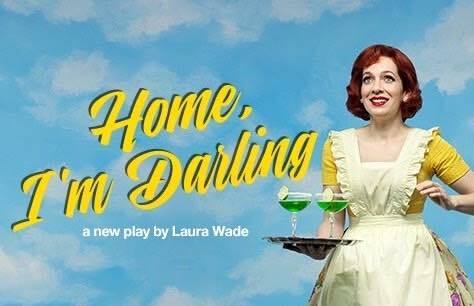 Her latest play, Home, I’m Darling, runs at the West End’s Duke of York’s Theatre from Tuesday 5th February 2019 (previews from Saturday 26th January 2019). It replaces the outgoing Tennessee Williams’ Summer And Smoke.